In the short history of the venue, Bruce Springsteen & The E Street Band performed three sold-out concerts back in 2003, U2 performed at the venue as part of the 360° Tour in 2011, Taylor Swift visited in 2011 as part of her Speak Now world tour and Kenny Chesney now performs either there or at Citizens Bank Park annually. This coming summer both Kenny Chesney and Taylor Swift will both be returning to Lincoln Financial Field for their North American tours. Swift, as part of her Red tour, will play shows on both July 19 and July 20 while Chesney will play on June 8 as part of his No Shoes Nation tour. Tickets for all concerts as well as all other events at Lincoln Financial Field this summer can be found right here at SeatGeek. 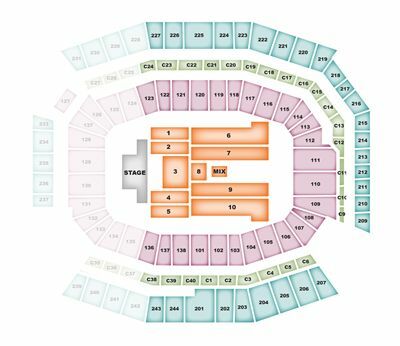 For a look at the seating chart for concerts at Lincoln Financial Field, check out the image below. The venue seats 68,532 patrons.